So, my experience of Kirkwall has been different but also absolutely wonderful. Up until now, I’ve been staying in hostels, an experience which has given me the opportunity to meet a wide array of amazing individuals. However, when I reached the nearest hostel in Kirkwall last night, it was empty. It was getting dark, so I went to next door to The Ayre Hotel, which feels more like a bed and breakfast. I would pay more, but for a night I would have my own room, my own bathroom, my own shower. After almost 10 hours of traveling, it was a no brainer. I checked in, through my stuff down, and immediately went out to take advantage of the remaining daylight. I scheduled a ferry trip to the Shetland Islands and a tour of the Highland Park Distillery and then I walked and took pictures for a while before returning to my room, showering, and passing out. When I awoke the next morning, I enjoyed a lovely breakfast of salmon and eggs that was included in the cost of my room. The staff at The Ayre Hotel even let me leave my pack there while I went out to explore more of Kirkwall. Professor Donna Heddle represents more than her university. She represents her proud people. One of the first things I saw that caught my eye was a sign that said “Nordic Studies,” so I walked in. 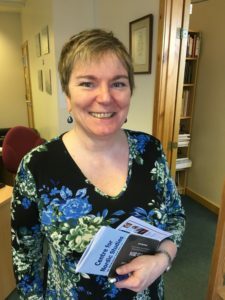 There I found Professor Donna Heddle, the Director of the University of the Highlands and Islands Interdisciplinary Centre for Nordic Studies. Lorraine is the owner of Cafelolz. 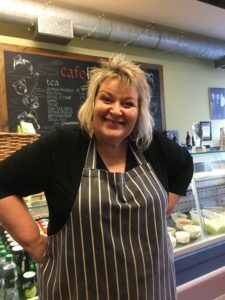 She puts a lot of love into her food and in caring for her customers. m saying, “Do it for the lols.” So, I headed that way. The cafe is located in the main shopping district, and it gets a lot of service from the passengers from the cruise ships that stop more and more in Kirkwall each year. But it’s also a favorite of locals. The people know each other, and there is a familial feeling there. There was even an elderly man, a regular, who entered on motorized wheelchair. They moved tables and made room for him to go to his regular spot. Lorraine cooks with a passion and is proud of her food, but she is equally attentive to her customers. She came over to speak with me. She explained the dish that I was having, haggis and clapshot. 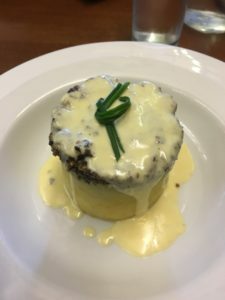 Lorraine’s haggis and clapshot with a whiskey cream sauce has given it a polished appearance but it’s packed with Orkney flavor. “Clapshot is neeps and tatties, a mash of turnips and potatoes. But clapshot is only served in the Orkneys,” she said. When she asked if I would like something sweet, I told her that the lemon meringue pie sounded delicious. She told me that she wanted me to try her award winning toffee and walnut dessert. Both were brilliant, but it was especially nice to experience them together. The pie was light, and citrus permeated it. The aroma immediately reminded me of the giant lemons in Malfi, Italy, and each airy bite sang with the pleasant acidy. Lorraine told me that the crust was special too because it wasn’t made from pastry. Rather it was made from sweet biscuits. The toffee and walnut was cut like a brownie and was a thick bar of sugar, nut, butter, and candy. It was rich and heavy, and I especially enjoyed it as I drank my black coffee. As we talked about the blog and I told Lorraine about Stella and Katie, she shared that her father, Tommy, had recently passed. There is still a seat cushion that says “RESERVED FOR TOMMY” on a chair towards the back of the restaurant. 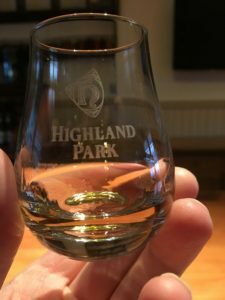 I soon headed out to go to the Highland Park Distillery. Now, I really love good food, and Lorraine had given me an experience with which I could have ended my day happily. But I truly love a good scotch, and I have always wanted to visit a distillery. I’m so glad that I ended up at Highland Park not just because of the great scotch but because of Mike, the man who took me on a tour of the facility. tory about when he opened a box of grenades and one of the pins was just about to pop out. Mike said that when his daughter, Elli, was born that he and his wife, Andrina, had to move back to Orkney. Mark is displaying the types of casks they use to make Highland Park Scotch Whisky. One’s American, and the other is Spanish. I won’t tell you which is which because that’s part of the fun of experiencing the tour. Mike wasn’t a scotch whiskey drinker earlier in his life, but he grew to love the spirit thanks to his uncle. And, as a representative of Highland Park, Mark demonstrates his love of not just scotch, but particularly scotch that comes from his beautiful home. that they smoke and heat the barley with is a unique mixture of heather, moss and grass. “The peat in Orkney is light and floral,” he explained. That’s a huge factor in the taste of the finish product. 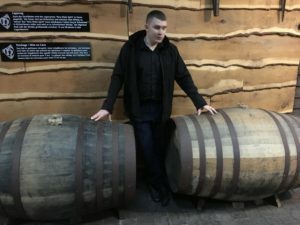 Another particular choice that they make at Highland Park in the distilling process is that they use only American oak or Spanish oak to build their casks, and, for the single malt whiskeys, they only use casks that have been seasoned with sherry for 18 months to two years. The weather in Orkney plays a major role in the maturation process. It’s fairly stable. It doesn’t get excessively cold in the winter or excessively warm in the summer. Mark said th at he hadn’t seen a formidable snow since he was in school. In other sections of Scotland, the scotch whiskey matures more quickly in the summer. In Orkney, it matures steadily. Mark took me all over the Highland Park facility, even to the top for a glorious view of Kirkwall, and then shared some of Highland Park’s best scotches with me. Just to give you an idea as to how good this scotch is, the 18 year old Highland Park single malt won best spirit in the world twice. The 25 years old won in 2013 with a hundred points, a feat that had not been achieved before in that blind tasting competition. Professor Neddle, Lorraine, and Mark are all proud Orcadians who represent the best of Kirkwall and the Orkney Islands. Damn! I am so jealous! Thank you so much for sharing your journey! I’m loving it! I was just talking to my best friend about that problem today. I’ve been trying to figure it out when I have time, but the answer has eluded me. If you do find an answer, please let me know. And thanks for checking out my blog! Luther, how can I link the wee video to my cafelolz Facebook page? Please do. It’s a public file on YouTube. I hope you’re doing well. Thanks again for your wonderful food and hospitality.